I just finished completing the third scene in episode 3 of Base Station 29. There is only one more scene to animate, but it's a doozy. I'm pleased with the way things are coming together. But I know that after I finish animating the entire episode, I'll have to go back and tweak shots that aren't quite the way that I want them. But that is super easy compared to what I'm doing now. It will be a while before I can estimate a completion date for the episode but I'll keep you posted. Base Station 29 Animation Ramping Back Up! Before the long break that I just took from animating "Base Station 29", I'd average finishing 3 shots of animation per week. Now that I've returned to the project and have reacquainted myself with it, I hope to get back on that schedule. Last week I did, indeed, animate 3 more shots for episode 3 which is a good sign that things are back on track. However, with more complex shots, the shot-per-week count will most certainly go down. So far, I've animated 35 shots for episode 3 of the series. By way of comparison, episode 1 was 72 animated shots and episode 2 was 51, so I'm about half way there. Shot of the new medical lab. The lighting is poor, but I think you get the gist. It has been well over a year since I've worked on Base Station 29 (I know, pretty pathetic huh?). Well, I hope today marks a new stage in the creation of the series. This year, I hope to crank out an episode or two. It will be a little while before I continue the actual animating though. I have to re-learn the software, re-learn where all of my digital assets are, re-acclimate myself to where I am in the story, and download new digital assets. That last part, downloading digital assets, is where I chose to begin. The image is of a medical lab that I recently downloaded. I plan to use parts of it in an upcoming scene. I'll be sure to keep you posted on my progress! I've been busy working on the final scene in episode 2 of Base Station 29. Here are a handful of the political players on the base station during one of their meetings. This shot introduces several new characters to the story. Those with speaking roles include Senator Hawkins played by Jack Bair, Shinji Official 1 played by Adam Harris, Shinji Offical 2 played by Justin Goodrich, and Human Official 1 played by Kevin Camp. Here is a better shot of Senator Hawkins. Everyone just left after visiting for a couple of hours of fellowship and the screening for episode 1 of Base Station 29. As an added bonus, those who attended got a sneak peek at 4.5 minutes of episode 2 as well! Both my wife, Jeannene, and I would like to extend a huge "thank you" to all who volunteered their voice for episode 1 of the series. We had a great time with all of you at the party and look forward to working with you again on future projects! Also, I just posted episode 1. If you are having trouble finding it, you can view it by clicking right here. Last night we recorded Justin Goodrich for Base Station 29. You can hear Justin's vocal talents in the animation/dramatic audio series, "Rezin". He is a very talented actor who can adjust his voice for use with a variety of characters and character types. For Base Station, he plays two Shinji Ambassadors - one of which will appear in episode 2 of Base Station 29. Thanks Justin for volunteering your talents once again! A big "Thank You" to Kevin Camp for volunteering his voice for the series. We recorded him Saturday morning, and he did a great job. Now that I've recorded his voice, I can design a character based on his performance. Kevin's character, "Human Senator", first appears in episode 2 of Base Station 29. I'd like to welcome Kevin Camp and Justin Goodrich to the Base Station 29 family. Kevin will play the voice of a human senator on the base, and Justin will play two voices; a Shinji Ambassador, and Ormani - a Shinji visiting our planet for the first time. A big "thank you" to both of these guys for volunteering their talents for the series. We will be recording Kevin's voice tomorrow morning, and Justin's is yet to be scheduled. But once these voices are recorded, I'll have all that I need to finish episode 2 of Base Station 29. I'm excited to see that animation for episode 2 is moving much quicker than it did for episode 1. One reason is that there aren't as many large vista shots with multiple people in large spaces. Also, over time, I've refined my animation workflow so that scenes come together quicker. Even still, I've been working on a new room from scratch, and will also need to create new characters who appear later in this episode. One danger to moving faster is that quality can suffer. I just hope I stay mindful of that along the way and try not to cut corners for the sake of time. With the release date of episode 1 in place (May 19th), episode 2 animation is now in full swing. It is my hope that this second episode will come together quicker than the first, and so far it is. As of the writing of this post, I have already animated the first scene for episode 2. But there still are a few environments that I need to create and a couple of voice actors that need recording. As much as I like episode 1, I can't wait to finish episode 2 where we begin to dig into the story itself. Yesterday, I officially completed episode 1 of Base Station 29! I'm currently in the process of compressing the episode for distribution over the internet, DVD & Blu-Ray which should be done by the end of the weekend. Why then (you might be thinking) am I waiting until May 19th to release a video that is already finished? Well, I first wanted to send it to a few local media outlets to generate buzz about the project. But even more important, I wanted to conduct a private screening for those who provided the voices for the episode on May 18th. I didn't want to officially release the episode until I shared it with them first. This is my first announcement of a private screening, so if you provided a voice for this first episode, details will be coming soon. For the rest of you, be sure to visit ktfproductions.com on May 19th to check out episode 1 of Base Station 29. If you are at all interested in Base Station 29, I hope you decide to follow this blog. Why? Because only here will I post exclusive, up-to-the-minute information. Sure, I'll eventually repost some of the information on the monthly Newsletter, and I might even retweet or share some of it on Facebook. But much of what I post here will not be available anywhere else, and whatever I share about Base Station 29 will be mentioned here first. You'll know if an episode is complete days, sometimes weeks before anyone else. You'll see exclusive images and read exclusive information. I plan to post at least once every week, most often on Friday. I've never done this with any other project, and am not entirely sure if it is a good idea with this one. Because learning up-to-the-minute information comes with a price. After a posting, plans may change. You might even hear about a finished episode only to learn that I don't plan to release it for weeks. And you may hear about Base Station projects that are being worked on but won't be finished for months. You'll know everything I know about Base Station 29, and only time will tell whether that is a good thing or not. So with that, let's kick off the biggest news of the month right away. 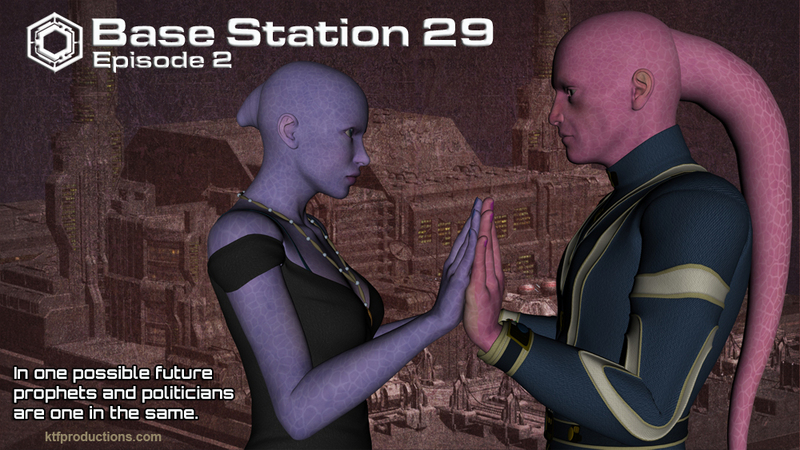 At this posting, episode 1 of Base Station 29 is almost completed. Technically, I've finished the 13-episode video, but there is one little audio inaccuracy that I have to fix. Today I burned a preview master to show to my wife (the producer) to find out what she thinks. If all goes well with that, I'll make the minor correction and the episode will be finished! I'm quite happy with how it turned out and look forward to sharing it soon. My current projection for release will be sometime in May. Visit often for more up-to-the-minute blog posts and know everything I know about Base Station 29!